Have you heard of Wrapp? It was a mobile app where you could send your friends gift cards -- completely for free. There were a bunch of brands on there, like H&M, Sephora, and Office Depot. I wish the app was still around, but it's not. When it was, my friend Kim sent me a $5 one for Office Depot, so I went to the store, knowing I was buying address labels. See, we need address labels for the wedding. You need address labels for the wedding. You don't want to hand write every person's address on the save the dates, the invites, the thank yous. Plus, you also have to write your mailing address on the RSVP cards and stamp them. That's a lot of potential cramps in your hand. Instead, you want to create address labels using a Word program. 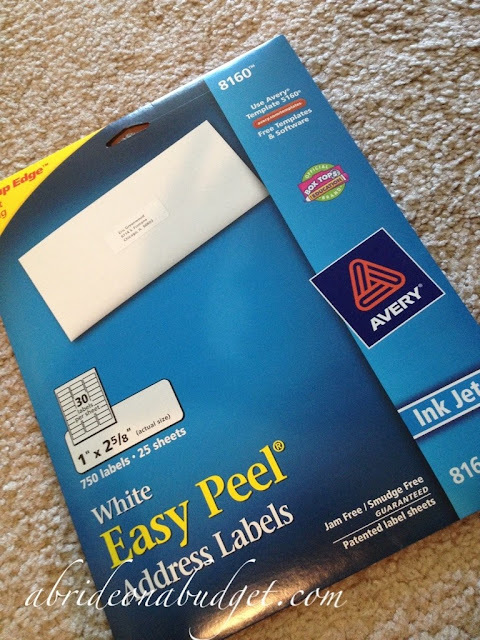 Save the file and print everyone's addresses onto address labels and affix them. I went to Office Depot today and the cheapest labels were $10.99 for 750. A little expensive, I thought. And first I thought a little excessive too. But not really. Let's do the math. Say you are sending out 100 invitations (one per couple, one per single person, and this averages you to about 175 guests, give or take families). So 100 save the dates, 100 invitations, 100 RSVP cards within those invitations, 100 thank you cards, and that's 400 labels already. If you're planning on putting return address labels on them, and trying to save by using the same package of labels, you will need 100 for the save the dates, 100 for the invitations, and 100 for the thank you cards. That's 700 right there. You only have 50 to spare. Luckily for me, we already have a return address stamp, so we are good. The labels for $10.99 were ones that looked like a pain in the neck to get off the sheet. Each label was directly next to the other with no breathing room. I can just envision Pete and I ripping them, picking up two at a time and accidentally folding one, getting mad, and eventually sticking them on crooked. The easy peel were $11.99. A dollar to save my future self a headache? Yes please. But still, $11.99 sounded so overpriced. Even after my $5 from my friend, it's still $6.99. 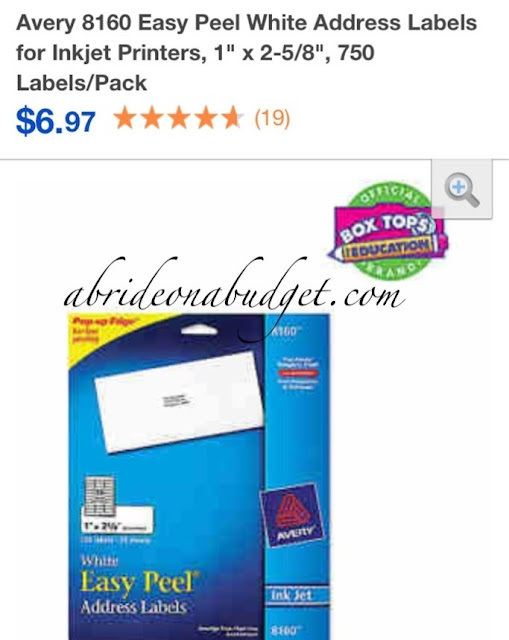 So I googled Walmart -- and Walmart sells the labels for $6.97. So Walmart is cheaper. A lot cheaper. But that involved driving to Walmart, and I was already standing in Office Depot. So, I wondered: Does Office Depot price match? I googled and sure enough, they do. But what I read was a website talking about price match, not Office Depot's site. And that site said the store won't price match from online ads, just from print ones. I figured I'd ask anyway. I showed the cashier at Office Depot the Walmart price from my phone and sure enough, she said yes, she would match it. She modified them to $6.97, took my $5 Wrapp gift card, and I paid $1.97 before tax for my $11.99 labels. That's a savings of over $10. Things like that, $10 here and there, that's what adds up over the course of your wedding planning. Your favorite photographer is gonna cost what they cost, and I wouldn't start negotiating. Just pay what they ask. Your ceremony site (church, beach, park, etc.) is going to charge what they charge, and you can't haggle with them. So don't try. But this kind of stuff, like address labels, you can knock down the price if you try and that is where your best savings are going to be. BRIDAL BABBLE: Did you hand write your guests' addresses on every piece of wedding mail? Boo, Wrapp, lol, but excellent on the price matching. What does it hurt to ask? And they were nice, and you got it! Office Max makes me mad because they will not even match their own online pricing, so I never go to them because the store is always more expensive than online. I wrote addresses for every Save the Date, Invite, and Thank You Card. I escaped having to do it for the RSVP envelopes because I got them printed. Happy you escaped addressing so many envelopes!!! I will defiitey be thanking myself later because oh boy, I'm just thinking about the cramps! You are a trooper for writing all those envelopes! I can't imagine! I printed the envelopes for all so no handwriting. I put the blank envelopes in the printer and made a file on work to print the addresses and stamped the return on the back.